South Dakota is famous for its solid agricultural base. This industry is huge here and plenty of hay, rye, honey, sunflowers, soybeans, wheat, cattle, and corn are produced in the state. If you are looking to pursue the tourism industry, The Mount Rushmore State would be a great choice as it brings in about $2 billion every year! Love exploring and seeing nature? South Dakota is home to many beautiful sites including Spearfish Canyon, Mount Rushmore National Monument, Badlands National Park, and Custer State Park, to name a few. Not only are there wonderful attractions to see, the state also has many safe cities. Let’s take a look at a few! 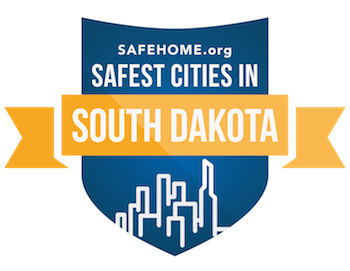 Of the 25 scored cities in South Dakota, 19 of them have a Safety Score of at least 80. According to our list, Sisseton is the state’s safest city, with a score of 98.74. It has a relatively small population of just 2,473 as of 2014, with a racial makeup of predominately white people. Most of the people living here are either families raising children or married couples living together. Located about 2 hours away is Sioux Falls, South Dakota’s most populous city. It made our list of safest cities in the state with a score of 71.14, which isn’t too bad considering 168,586 people lived here in 2014. Pierre, the State Capitol, ranks as the 22nd safest city in the state with a score of 74.8. In 2014, this city had a reported population of 14,054. Some other cities that scored above 90 in South Dakota include Winner (95.66), Lead (95), Madison (93.62), and Hot Springs (92.22). All of these cities are smaller with populations under 10,000 people. Madison is home to Dakota State University though, and is a great place for students to be. Parents can be assured that their children are in a safe area while receiving their education.